Although we are primarily an automatic screw machine and production turning contract job shop, our facility includes a supporting secondary department with a Brothers Machining center, a Sunnen Hone and CNC Chucker, as well as millers, drill presses, arbor presses etc. West Warwick Screw uses quality heat treating, centerless grinding (end feed and thru feed), broaching, plating, material testing, painting, etc. sub-contractors. 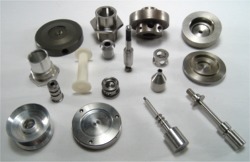 Also, our CNC machining center and lathes are utilized to perform operations on small castings or partially machined components supplied by the customer. Trepanning and internal recessing on the automatic screw machines have become an area of specialty in recent years. We have no minimum runs in general, however, we usually manufacture small to medium lot sizes. Quantities in one-to-five hundred and one-to-ten thousand are typical. We also run some 50,000 to 75,000 annual quantities. On the other hand 25 to 100 piece lots are not uncommon for our CNC departments.